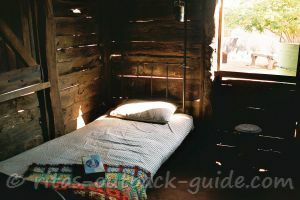 Congrats for your web site, it s full of great information and I can't wait any more for my travel. 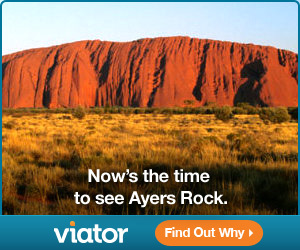 I am about to do a trip from Melbourne to Alice Springs from the 10th of June to the 20th. We are planning to go through the Flinders Ranges and then head to Marree, go through the famous Oodnadatta track until William Creek and then come back to Coober Pedy through the William Creek Rd. We have a normal car (compact car) and even if this part of the track can usually be taken with a normal car, we are wondering if it is still possible considering the recent heavy rain. Do you think it is reasonable? How is the William Creek Rd? How is the road from the Flinders Ranges to Marree? Hmmm, in good conditions the Oodnadatta Track, especially the section from Marree to William Creek could be done with a normal car (if it is your own, not a hired car) and careful driving. But... I just checked the road conditions, and it looks like it is not very reasonable right now. I am not sure how much things will improve until next week. The roads in the Flinders Ranges are no problem, from Hawker to Wilpena Pound and up to Blinman the roads are sealed. To turn west to the main road to Lyndhurst and Marree you can either go through Brachina or Parachilna Gorge which are both very scenic. 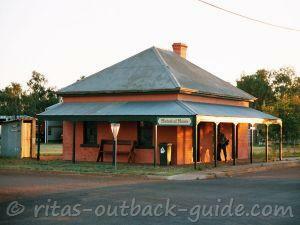 Have a look at my Flinders Ranges pages. 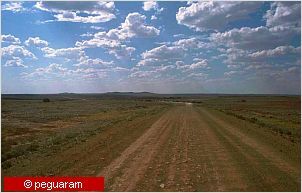 The road from Lyndhurst to Marree is in good condition, they even prepared to seal it at the end of 2008. I am not sure if they are finished with that project by now. I remember when I planned the first trip along the Oodnadatta Track the roads were closed due to rain when we left Adelaide. 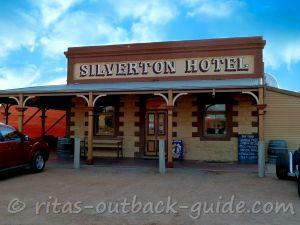 We took our time in the Flinders, and once we arrived at Marree, the track was open. I would just keep an eye on the weather reports and the road conditions. And check out some general tips on how to prepare your car. Good luck and have a great trip, I hope all goes well. The Hawker to Leigh Creek Road is fully sealed, even further up until Lyndhurst. I wouldn't recommend a shortcut from the Flinders via one of the gorges to the Leigh Creek Road with a large caravan. 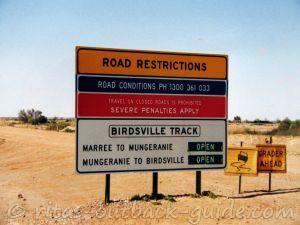 So, it is probably no problem to get to Marree. But opinions vary much if a caravan on the Oodnadatta Track is a good idea. I don't have any experience towing a caravan. Plus, it depends on the road and weather conditions on the days you are actually out there. Click here to read more what other travellers think about towing a caravan on the track. 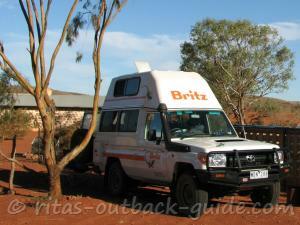 We are planning to visit Flinders Ranges and then continue on to Coober Pedy early July. Caravan is a 19ft with long overhang at rear. 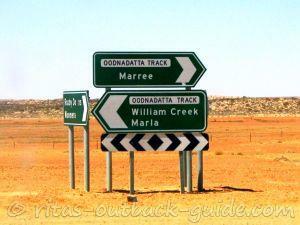 Is it wise to go via Oodnadatta and Leigh Creek tracks? Alternatively we could go south to Roxby Downs, though that will be further. Would appreciate your advice. When you are in Coober Pedy right now, the best advice I can give is ask the locals... at the petrol station, the police, travellers who just came from William Creek. Looking at the road report from today, Saturday, it says the Coober Pedy to William Creek road is only open for 4WD. They warn of soft sections. Remember, there was a lot of rain, it will take some time until all roads are dried out and the grader went through. I'm in Coober Pedy now - looking at taking a normal car to William Creek. Hope that should be OK. Any advice or comments welcomed. Thanks for the compliments, Luke. I am not an experienced driver (I let the boss do it), and we haven't towed anything on Outback roads yet. Your Windsor is a huge thing. It's not the road itself that can cause problems, but some of the creek crossings. If the rain stops now, and the graders have done their jobs until June, perhaps you can make it, I don't know. Contact the locals in Marree or William Creek before you go and ask for advice. Congrats Rita on a great site. Planning to take the crew (5 kids under 11 and wife) in our Windsor Rapid 592S (7,7m) which is fitted with off road suspension towed by our Patrol 4.2 diesel. Plan is to go to the Flinders Ranges up to Marree to W'm Ck, day trip out to the lake, then turn left to Coober Pedy and then up to the big yonny. Will the rd trash the van? car? kids? wife? Will we get through?Plan to head off in June and take 6-8 weeks. So we're not in a hurry. Hi Jim, Hopefully the roads should be ok by the time you go but you can never be sure so check before you go. If the roads are open you won`t have any problems. May I suggest that you take the road from Oodnadatta to Cadney through the Arkaringa Hills, known as the Painted Desert. These are colourful mesas which are that way because of gypsum and other minerals leeching into the soil. Cheers from Terry. What about Jume July this year? Hi everyone, great read for someone clueless like me. Looking at doing this trip in late June early July this year, how are the road around that time of the year? Dried out or....? Planning to take our late model Subaru Outback and a light camper trailer. Aim is to loop from the south through the Flinders Ranges, Lake Eyre, Williams Creek, Coober Pedy then back south. Any suggestions would be appreciate. Thanks Terry, really looking forward to our trip..you're right, no point in whizzing past all the scenery!!! Re Ooodnadatta Track and William Creek. Hi Chris, I would say that by October the roads should be all dried out. 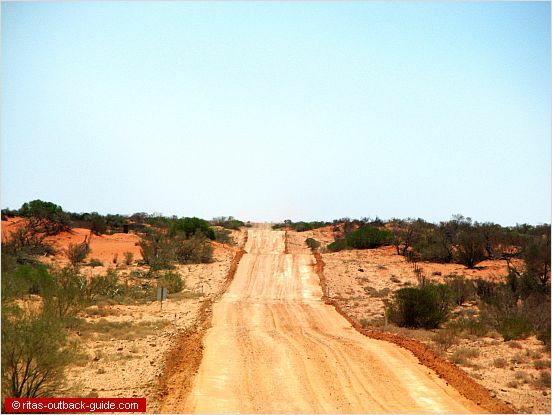 As far as the Oodnadatta Track and Strezelecki Track is concerned I wouldn`t worry too much about tackling them in a normal car. 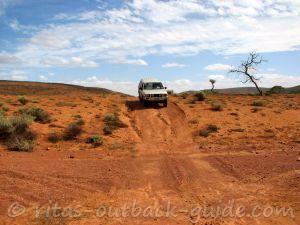 Most of these outback tracks have been upgraded in recent years and should present no problems to the careful driver. I can go back to the early 60`s when I toured the country in a Hillman and later a falcon and the roads were much less maintained in those days. Just drive to the conditions mate and take your time. I wouldn`t recommend doing Cape York or any similar trip in anything less than a 4WD but those roads you intend to take I`m sure will present no problems unless you drive like a nut. But what`s the point of that. You are out there to take it easy and enjoy the scenery , right! 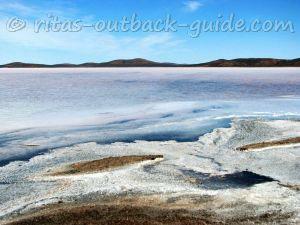 Maree -William Creek travel in Oct.
We are planning to travel to Lake Eyre in late October. I have taken on board all your good advise re the Flinders. We are concerned about the state of the roads from Maree to William Creek. One of our party is thinking of driving a "normal" car. We are especially concerned after the stranding of people at William Creek this weekend. Does that mean the roads will be chopped up? 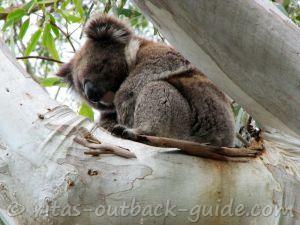 We were hoping to return to NSW via the Strzelecki Track. What is your advice there? Hi Manon, I agree with Rita but you should make sure you visit the Flinders Ranges where you will get up to date information from the National Parks Office I`m sure. You shouldn`t have any problems with roads in the Ranges unless of course it has been or is raining at the time and if the roads north of Maree are out it isn`t far for you to return to the main north road to Alice. Cheers from Terry. Terry expressed exactly what I wanted to say, driver's experience and careful driving is the key out there, whichever car you drive. You can certainly get information in the Flinders in places like Wilpena and Rawnsley Park, there's probably internet access for travellers to check the road conditions. 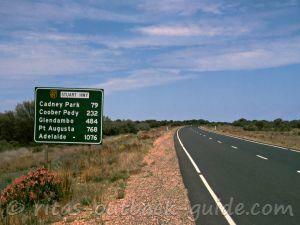 As I said above, the best way is to go to Blinman and the via the Parachilna Gorge to the main road to Marree. And yes, don't forget to visit the other gorges in the Flinders. I had a look at the outback roads report and it seems that for the moment we can go till William Creek with a normal car but then can't take the road from william creek to Copper Peddy. What do u think? 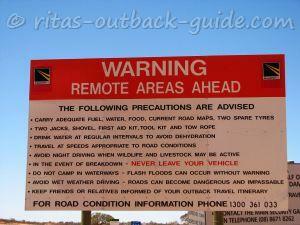 There are only warnings from william creek to marree, is that fine?